CRINCH! #CrabOfTheDay for 07/25/2016: Carcinoplax longimana, The Chinese Longarm Pyramid Crab, is a marine Superfamily Goneplacoidea species easily identifiable by its ridiculously oversized chelipeds! C. longimana is readily found in the mud, sand, or broken shell beds (30-100 m. depth) of South/East Africa, South/East Asia, the Subcontinent, the Red Sea, and the Andaman Sea. Females of the species have substantially smaller arms than males, who’s habit of “holding them up in a triangle shape,” most likely lends to the ‘Pyramid’ in their common name. Fun Fact: Two distinct subspecies/morphologies of C. longimana existed in the taxonomic sense before being unified in recent years. Carcinoplax longimanus japonicas, and Carcinoplax longimanus typicus were originally catalogued by German Zoologist, Franz Theodor Doflein in 1904. CRINCH! #CrabOfTheDay for 07/26/2016: Thalamita danae, known in the Philippines as “Mani-it,” is a family portunidae predatory swimming crab. This Indo-Pacific tropical monster (whose name coincidentally means ‘a small, quarrelsome crab’ in Cebuano) has an extensive distribution; from Australia in the East and Mozambique in the West. Hunting near coral rubble and reefs, T. danae is particularly active at night when it prefers to hunt for shrimp, gastropods, and even other crabs! This species carapace is covered in dense, fine hairs often trapping a layer of sand on its body. CRINCH! #CrabOfTheDay for 07/27/2016: Varuna litterata, or The Oceanic Paddler Crab, an Africa through the Indo-Pacific species of Grapsid crab. Light brown to reddish brown in color, this species prefers areas facing oceanic waters as it is “euryhaline” and “estuarine” meaning it can live on land and low water, in a variety of salinity zones- marine to freshwater to brackish mud. Also called the “Herring Bow Crab,” “River Swimming Crab,” and “Swimming Rock Crab,” this beastie may also be found on drift wood and flotsam well out in the sea as their relatively flattened, hairy legs enable them to swim for short distances. V. litterata, like all Varunid crabs, is an omnivorous scavenger; something which helps it very little from being pickled in vinegar/salt or deep fried by locals! CRINCH! #CrabOfTheDay for 07/29/2016: Helice latimera, or Ebi-me iwagani (エビ目イワガニ ) is a species of East-Asiatic estuarine crab and among the most common crabs along the numerous coasts of China. These little crabs (whose name in Japanese means “Shrimp-Eyes Crab”) burrow in muddy substrates of upper littoral and supralittoral zones, especially in salt marshes and estuaries. These crabs have an inverted cheliped stance, resting the ‘thumb’ on the topside rather than lower side. 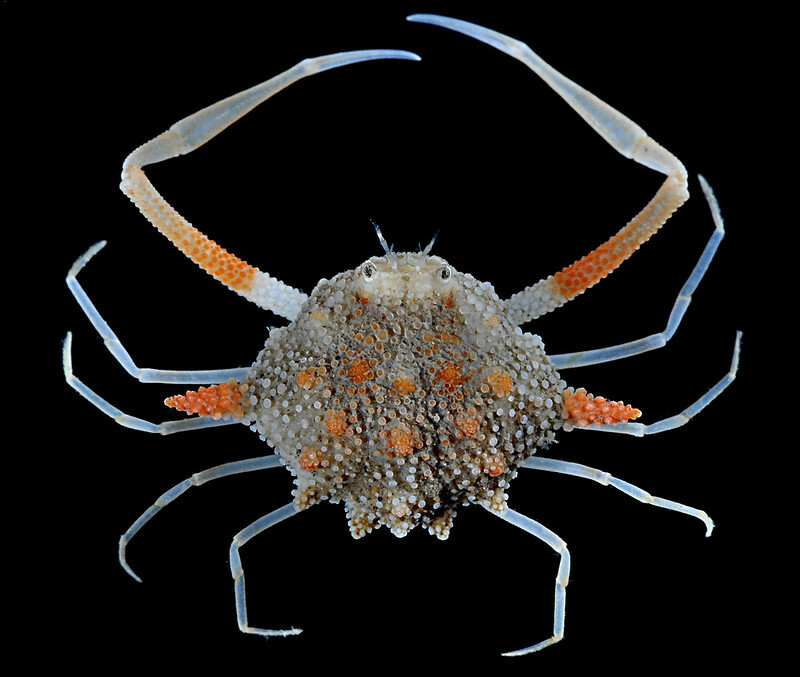 Oddly enough, Helice crabs- as numerous as they are, comprise a genus containing only 4 species: Helice formosensis, Helice latimera, Helice tientsinensis, and Helice tridens. CRINCH! #CrabOfTheDay for 07/30/2016: Izanami curtispina, The Gulf Shortspine Crab (短刺伊氏蟹) is a benthic species, native to Japan, China, Taiwain, Phillipines, Indonesia, and Australia. 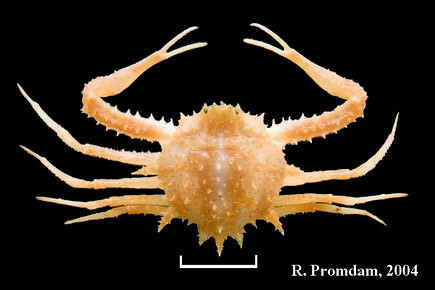 Identifiable by its broad pereiopods, circular carapace with a pattern of six distinct tubercles, and knobby claws- I. curtispina comes from a family Matutidae genus containing only 2 species. This Asiatic crab is directly named for the Japanese Shinto deity 'Izanami-no-Mikoto,' meaning "she who invites" is a goddess of both creation and death. The ‘Curtispina’ in its name means shortspine. CRINCH! #CrabOfTheDay for 08/01/2016: Ovalipes australiensis, or The Common Surf Crab (sometimes the Australian Sand Crab) is a distinctly Australian/Oceana species, known for being able to bury itself in sediments extremely quickly! This blue-grey crab has two distinctive 'eye' spots near its back- not that you’re likely to see them; O. australiensis is keen to stay buried, with only its eyestalks popping out! Tide fisherman find the Surf Crab a nuisance because they bite their bare feet in shallow water, and expertly remove bait from their fishing hooks. Usually active at night, this species also is gifted with paddle-shaped 4th row legs, allowing for increased agility in the water, which they use to catch prey. CRINCH! #CrabOfTheDay for 08/02/2016: The Masked Burrowing Crab, or Gomeza bicornis is an Indo-Pacific species of family Corystidae Burrowing Crab. Like all other burrowers, (I’m looking at you Mole Crab!) G. bicornis digs deeeeeeep tunnels in the sand of beaches and tidepools. Masked Burrowers can be pretty elusive because of this! As its name suggests, (bicornis = TWO HORNS!) this guy has two massive antennae on top of its head; the interlocking hairs on the antennae most likely facilitate oxygen exchange, functionally serving as a ‘breathing tube’ for the buried crab. This species and its sister-species (Jonas formosae) are listed as 'Vulnerable,' as Anthrogenic destruction of its habitat, especially in Southeast Asia has contributed to increased displacement and smaller spawn counts. CRINCH! #CrabOfTheDay for 08/03/2016: Ixa pulcherrima, or The Spiny Jewelbox Crab is a FANTASTIC marine family Leucosiidae species hailing from Sri Lanka Eastward through coastal Australia. This beautiful Brachyuran is covered by numerous jewel-like granules on the surface of its carapace. Additionally, elongated claws, and seven distinct spines (5 small, 2 large) on the sides and rear margins of its back make I. pulcherrima extremely unique. This stunning crab was officially catalogued by Scottish zoologist and winner of the 1915 Clarke Medal, William Aitcheson Haswell, in 1879. CRINCH! #CrabOfTheDay for 08/05/2016: The Domed Elbow Crab, or Cryptopodia fornicata is a member of a distinctly shaped subset of family Parthenopidae elbow crabs known as "buckler crabs." 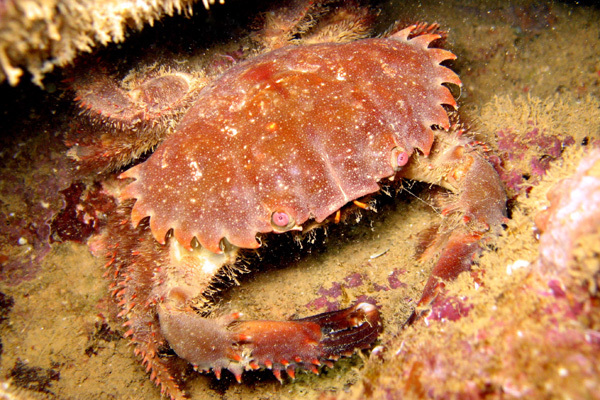 Also called the 'Flat-Rock Elbow Crab' and occasionally the 'Bat Crab,' this Indo-West Pacific species is known for its extremely triangular, concave carapace, ‘tucked in’ ambulatory legs, and knobby chelipeds armed with sharply lacinate spines. 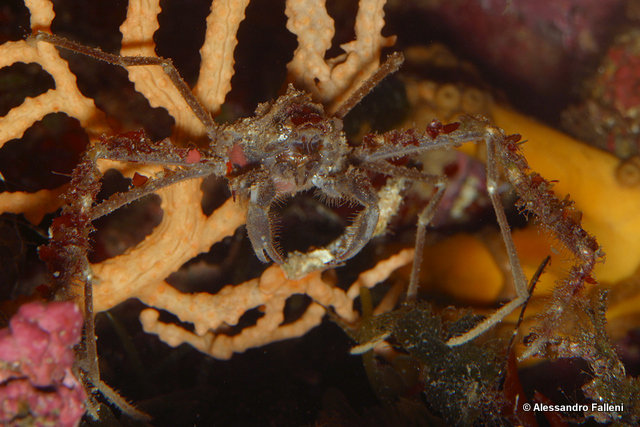 Preferring the potentially fragile biomes in the muddy/shelly substrate at depths of 10-30 m, this crab is listed as 'Endangered' on the Red List, as it and other related Indo-Pac Cryptopodia species hold an extremely important environmental niche. CRINCH! #CrabOfTheDay for 08/06/2016: Rhizopa gracilipes, or The Graceful Reef Crab is a Southeastern Asiactic crab belonging to Superfamily Pilumnoidea, Family Pilumnidae, and Subfamily Rhizopinae. CRINCH! #CrabOfTheDay for 08/08/2016: The Spiny Pebble Crab, or Arcania erinacea is a spiky (Duh!) 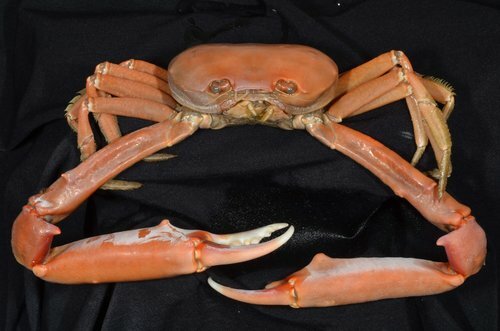 family Leucosiidae crab found in the tropical waters of the Indo-West Pacific, with outlying populations located in the Persian Gulf and South China Sea. This species prefers the benthic substrates at the 7 – 85 meter depth zone. Like other pebble crabs, A. erinacea has a globular carapace and long, slender legs and claws. Differing from its cousins however, Spiny Pebbles are COVERED with thorns and spine-like granules including two prominent, sharp “teeth” in front. CRINCH! #CrabOfTheDay for 08/10/2016: Thalamita spinimana, or The Red Claw Swimming Crab is a classic family Portunidae predatory swimmer. This Species (also known as the Red Swimming Crab or the Spiny Claw Swimming Crab) is a reef-associated, shallow tropical water dweller from the Indo-West Pacific- primarily Southeast Asia and North Australia. Identifiable by its bright red-to-brown rectangular carapace, standard last-pair paddle feet, and spiny chelipeds, T. spinimana is an extremely common sight in regional waters. Be careful though, these guys put the ‘crab’ in crabby; they've been described as "vicious," and can give a good pinch to probing fingers. CRINCH! #CrabOfTheDay for 08/12/2016: Neohelice granulate, or the Atlantic Saltmarsh Burrower Crab is a fantastic semi-terrestrial species from the Southwestern Atlantic Ocean- namely from the Golf of San José (on the north side of the Valdes Peninsula in Patagonia, Argentina) to the Laguna Araruama in Rio de Janeiro state, Brazil. N. granulate is extremely prevalent, being taxonomically described by Dwight Dana, (who named it Chasmagnathus granulates) in 1851, yet observed and documented by Alcide d’Orbigny during an expedition to South America between 1826 and 1834. Found in the intertidal zone of estuaries, salt marshes and mangroves, Atlantic Saltmarsh Burrowers fill an important role as an “ecological ecosystem engineers,” greatly impacting sediment chemistry; soil drainage/aeration, and the dependent biology of its main food source: the Atlantic Cordgrass, Spartina densiflora. CRINCH! #CrabOfTheDay for 08/13/2016: Helograpsus haswellianus or Haswell's Shore Crab is a great family Varunidae continuation in my ongoing foray into burrowing and marsh crabs. These southeastern Australia natives are indistinctly brown yet have VERY distinct singular notches in theorbital tooth behind each of their eyes. 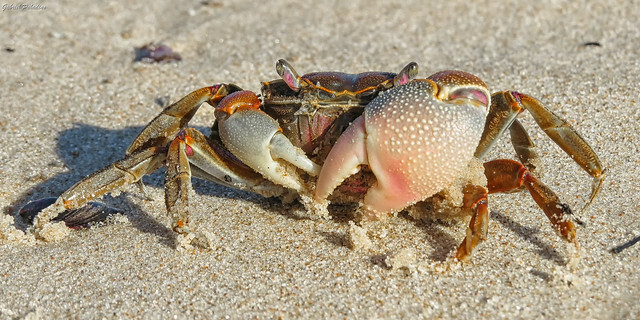 Haswell's Shore Crabs dig burrows for protection in sand or mud above the high tide level. They can produce an elaborate interconnecting series of burrows in muddy estuaries – which serve an important function in soil aeration. In an environmental twist, Mud Shore Crabs can live in areas greatly affected by pollution carried in from storm-water run-off. The species name honors William Haswell, formerly Professor of Biology at the University of Sydney. CRINCH! #CrabOfTheDay for 08/14/2016: The Rocky-Shore Hermit Crab, or Pagurus anachoretus is a predominantly Mediterranean hermit, found on the rockier shores of Portugal through MENA. Seldom larger than 3 cm in body length, this little subtidal crab has setae covered legs and bright pale green eyes. Co-Opting the discarded shells of gastropods, Troques, Cérithes, moon snails etc... P. anachoretus frequently picks up bonus shellmates such as the Sagartia Ventana Anemone and the Cnidarian Calliactis parasitica. CRINCH! #CrabOfTheDay for 08/15/2016: Neognathophausia gigas, or The Giant Red Mysid Shrimp is a family Gnathophausiidae lophogastrid crustacean (somewhere in between a crab and a shrimp) known as a “Mysid.” These little critters are distinct with their spinal ‘thorns’ which dissuade predators from chomping them! Additionally, Gnathophausiidae are the only mysids with a light-producing organ. (Glowing reddish in the image I posted here!) N. gigas prefers the colder-to-polar waters in the Antarctic and southern most reaches of the Indian Ocean. CRINCH! 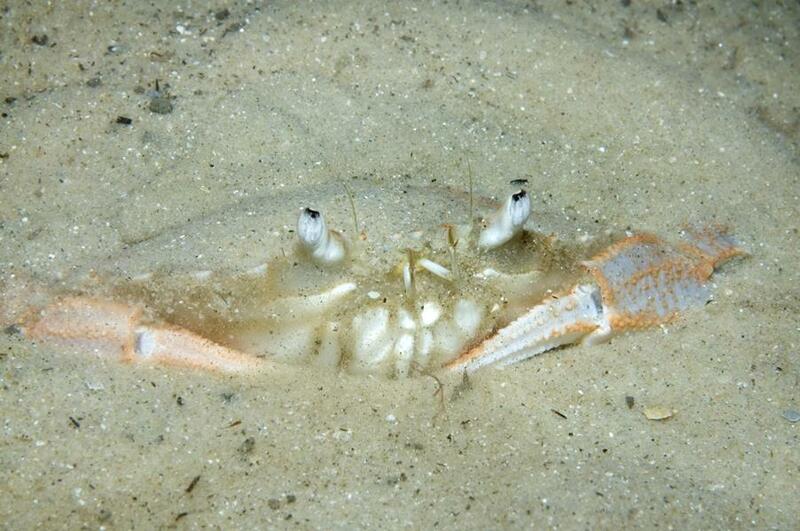 ‪#‎CrabOfTheDay‬ for 08/16/2016: The Crucifix Crab, or Charybdis feriatus is a tropical Indo-West Pacific species of swimming crab. Named for the cross-shaped pattern on the carapace, the scientific name “feriatus” literally translates as “holy day.” Given these striking markings, C. feriatus is the subject of some interesting Jesuit mythology. As the story goes, Saint Francis Xavier, while in Indonesia is said to have lost his crucifix during a storm. The next day as St Francis was near the shore, a crab crawled up to him carrying his crucifix between its pincers. St Francis reportedly blessed the crab and since this time these crabs have had the cross pattern on their carapace. 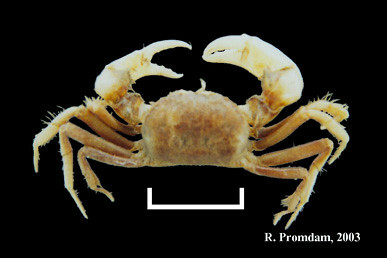 family Xanthidae species of crab found from Madagascar to East Oceana. Named for the distinctive saw-like teeth on the edge of its carapace, this fantastic crustacean is often seen near reefs abundant with a variety of corals. Additionally, this funny looking sawblade-with-a-face can be spotted by its bright pink to purple eyestalks! CRINCH! #CrabOfTheDay for 08/18/2016: The Australian Boxer Crab, or Lybia australiensis is an Indo-Pacific Boxer Crab, aka ‘Pom Pom Crab’ presumed native to the reefs around Australia’s Eastern Coasts. Like all Boxers, these guys have a mutualistic relationship with Bundeopsis spp. and Triactis product sea anemones, which they hold in their claws for defense. In return, the anemones get carried around which may enable them to capture more food particles with their tentacles. (Pro) Lybia australiensis is a pretty poorly understood species, known only from ONE female specimen, collected in 1928 among bryozoans at Port Jackson, New South Wales and stored in the Australian Museum. (Sydney) Including this crab, the genus Lybia contains only 10 taxonomically recognized species to date. Speaking of ‘taxonomically recognition,’ this little crab was first categorized by enigmatic actor, naturalist and marine collector, Charles Melbourne Ward, in 1933. Check out his biography below! CRINCH! #CrabOfTheDay for 08/20/2016: Podochela curvirostris, or The Southern Neck Crab is a classic example of a Family Inachidae decorator, found in the West and (infrequently) North Atlantic and primarily in the Gulf of Mexico. This Milne-Edwards species is often found associated with sponges and coralinacean algae that it coats its body with as a predator deterrent. 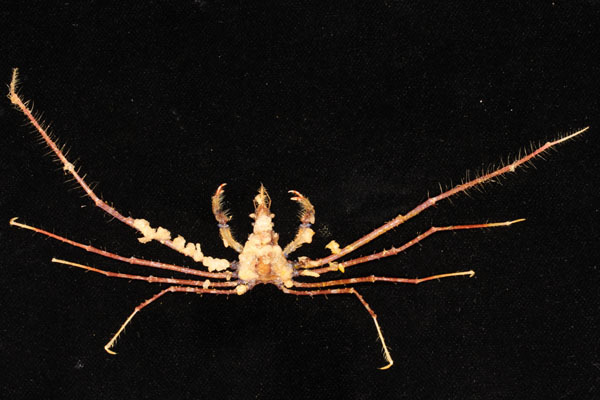 Living on the hardrock sediments and beds found at the 100 m-500 m depth range, P. curvirostris has that distinct decorator/arrow crab head shape, lacking orbits for their eyes to lie into. CRINCH! 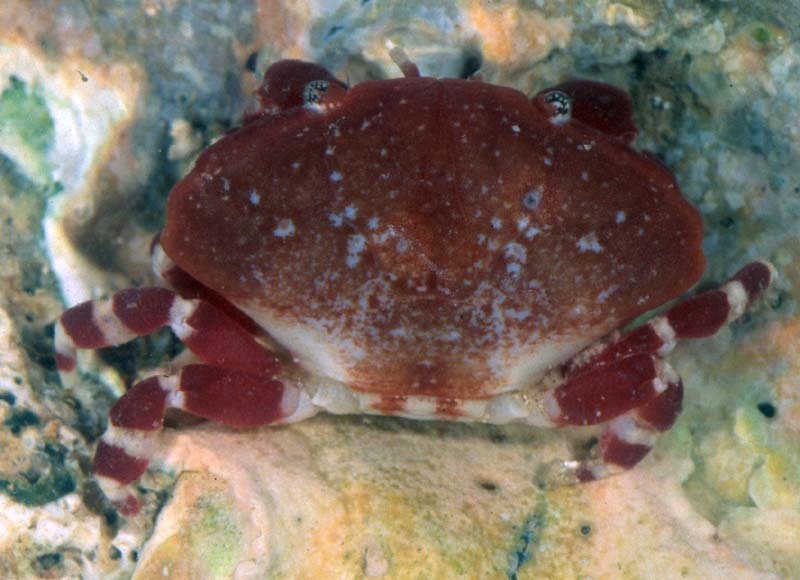 #CrabOfTheDay for 08/21/2016: Atergatis roseus, or The Rosy Egg Crab (פצחן אדמוני meaning "Red Cracker" in Hebrew) is a widely distributed, sometimes invasive Family Xanthidae/Subfamily Zosiminae species. Ranging from Levant/MENA through African and Indo-Pacific waters, A. roseus prefers shallow reef rich areas with plenty of hiding spaces. Egg crabs are more active at night, but nevertheless, usually slow moving and always near some hideaway into which they scuttle at the first sign of danger. As a backup plan however, Atergatis roseus and its cousin species’ are among the most poisonous crabs in the world! Their toxins are not readily destroyed by heat or cooking as they stem from bacteria that live in symbiosis with the crabs. 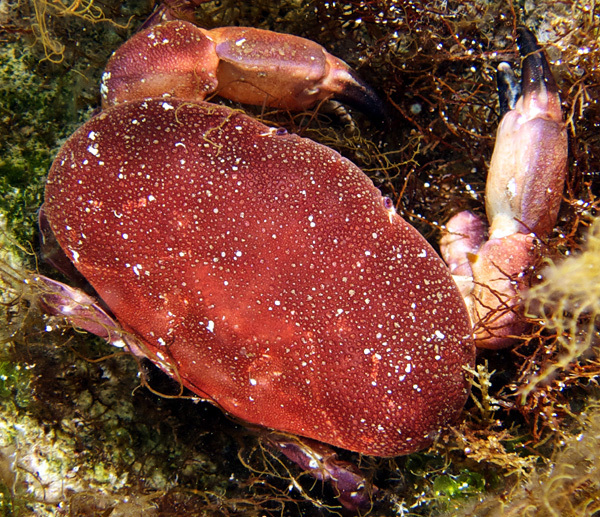 The Rosy Egg Crab was first taxonomically catalogued by Wilhelm Peter Eduard Simon Rüppell, a German naturalist and explorer, in 1830. CRINCH! #CrabOfTheDay for 08/21/2016: Liomera tristis, or the Mournful Round Crab (another Dana species!) is a reef-dwelling nipper from the East African coast in the Indian Ocean and to the East Pacific region of Oceania. This Family Xanthidae crab is primarily an algae-vore, yet like many round/egg crabs, it will eat other meals of opportunity such as dead sea critters, plants, and detritus. Living on the oft-exposed surf rock in the intertidal zone, L. tristis pretty much prefers places which offer plenty of hiding places. Like with other round/egg crabs, Mournful Round Crabs have some BRUTAL, symbiotic-bacteria-borne neurotoxins. These paralytic shellfish toxins (PSTs) work by blocking voltage-gated sodium (Na) channels in neurons via the protein saxiphilin. CRINCH! #CrabOfTheDay for 08/23/2016: The Orange Signaller Crab, or Metaplax elegans is an India-through-Southeast-Asian species of family Varunidae mangrove crab, named for its bright-orange claws. Typically found digging burrows in very soft mud near stream banks, these energetic crabs amass in large numbers at low tide. M. elegans Males have much larger claws than the females, with which they wave around, and 'bounce' up and down on their legs, to compete for females. Feeding mainly on worms, these semi-terrestrial crabs seve an important role in mangrove soil bioturbation. CRINCH! #CrabOfTheDay for 08/23/2016: Inachus communissimus, or the Host Spider Crab is an amazing family Inachidae Spider Crab found in the Mediterranean depths from Portugal and North Africa to The Adriatic, Aegean, Alboran, Balearic, and Ionian Seas. These Brachyurans are named for the colonial ascidians (Diplosoma listerianum) and filamentous green algae, which live their entire lives on its exoskeleton. This crab’s Latin suffix “communissimus” in fact, means “which hosts other with affability and gentleness.” Younger I. communissimus crabs are covered with setae, allowing for even GREATER levels of community epibionts living on it- at least until its pubescent moult. BTW: An epibiont (from the Ancient Greek meaning “living on top of”) is an organism that lives on the surface of another living organism. CRINCH! #CrabOfTheDay for 08/24/2016: The Crenate Swimming Crab aka Thalamita crenata, is an Indo-Pacific and MENA species, and perhaps one of the most common family Portunidae crabs living river/creek adjacent where freshwater meets sea at vegetated deltas and mangroves. Like all swimmers, T. crenata has the modified paddle-shaped last legs. 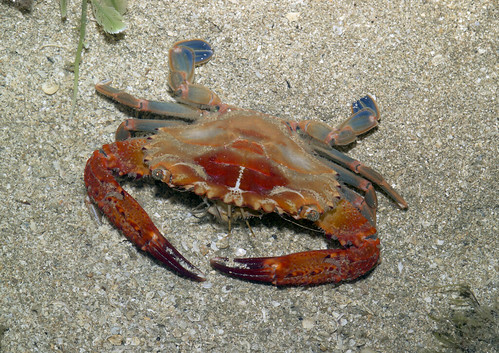 This adaptation allows for hunting and predatory behavior by this crab, ALSO making them more difficult to catch! Not to say that algae, muck, bivalves, and even other crabs are out of the question, as Crenate Swimmers are also opportunistic, detritivorous cannibals! 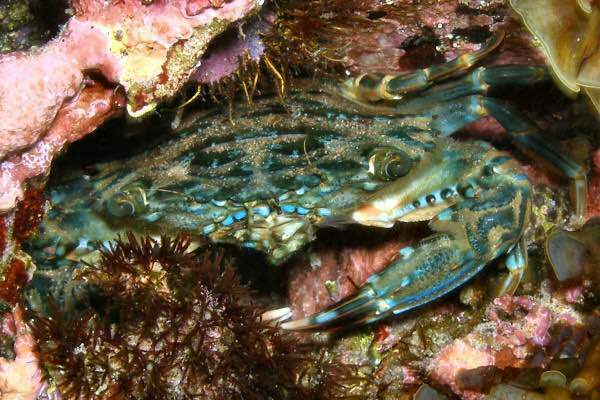 Given their increase capability for ranging, these crabs exhibit actual HOMING behavior to find their burrows/hidey-holes, based on underwater landmark memory.